A new weekend-long program in Cambridge, Maryland gave young people a full immersion into sailing last weekend-- from boatbuilding basics to competing in a regatta. The Underground Railroad Freedom Regatta is named for the rich African-American history around Cambridge. The event connected 15 African-American students with local maritime industry leaders. The students were all between 13 and 16 years old, and many came into the program with little sailing knowledge, despite living near one of the Bay's busiest waterfronts. The group started at Richardson Maritime Museum on Friday, learning from the shipwrights at the historic boatyard Ruark Boatworks. Students tried out the hand tools used to craft a boat, like chisels and a bandsaw. Next, they visited custom boatbuilder Composite Yacht Company in Trappe, Maryland, where the boatyard was in full operation, and students got to see employees fitting fiberglass for a client. At Composite, each teen got to build a 2-foot-long model dory to take home. With a new understanding of how a boat comes together, the youth had the chance to set sail on Saturday, side by side with the members of the Eastern Shore Sailing Association. They competed in a special regatta out of Cambridge Yacht Club on the Choptank River, participating in two one-hour races. The skippers of four privately-owned cruising sailboats, all between 28 and 36 feet, took three or four students on board for the races. After a morning of racing, the students were treated to a swim at the Dorchester County Pool in Cambridge. Later, they attended a spaghetti dinner and awards ceremony, where the winners of the handicap races were revealed, and all of the students got a certificate of completion. The Underground Railroad Freedom Regatta was the brainchild of marine technician Marcus Asante and his Marine Arts Workshop organization. Harvesting Hope, Inc., a family services center in Cambridge, helped connect youth to the new program. 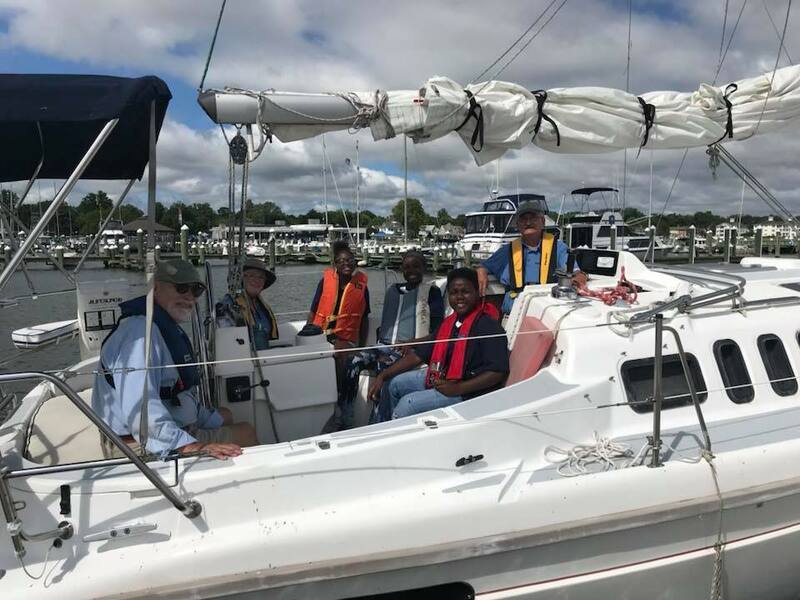 Asante is an active advocate for diversity in sailing on the Chesapeake, and wanted to connect young people to the legacy left by Dorchester County native Harriet Tubman and the people who used the Underground Railroad. Asante said it was a chance for students to "live out some of our themes, like the idea that you have to work for what you want in this world," as the Underground Railroad people did. In this case, he said, students had to "earn their right to get on a sailboat" by taking part in boatbuilding lessons and making their own model boat. The program was funded exclusively by private donations. Asante calls the program a "resounding success" and hopes it will become an annual event, with even more opportunities for Cambridge youth. Said Asante, "It was humbling for me to see so much gratitutude, to be the recipient of those smiles."